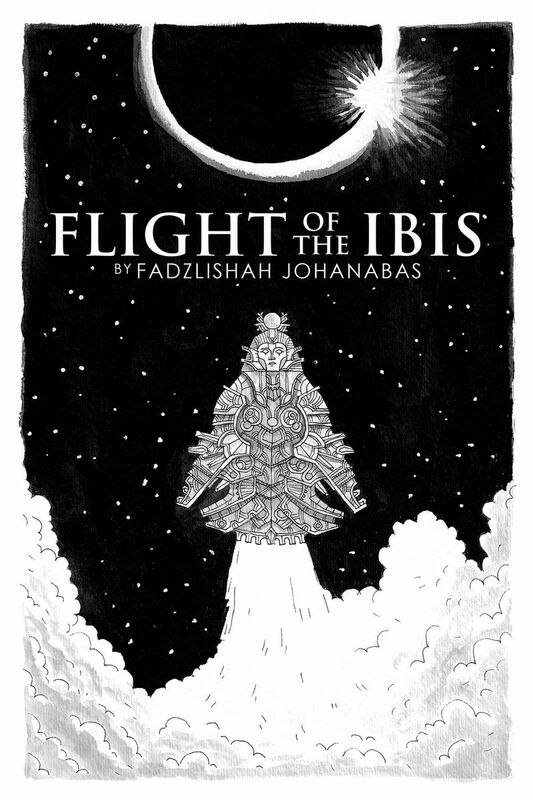 Today’s Tuesday Fiction is by Fadzlishah Johanabas from Malaysia. Fadzlishah Johanabas is, at the moment, a neurosurgeon-in-training. When he’s not opening up people’s heads, or reading about the minute details of the human wiring system, he writes. His works have been published at COSMOS Australia, Poe Little Thing, World English Literature: new Malaysian stories, The Best of Every Day Fiction, Expanded Horizons, and Skive Magazine, among other venues. He was also the first runner-up for SFReader’s 9th Annual Short Story Competition, and a finalist for Selangor Young Talent Awards (creative writing). Fadz can be found occasionally updating his blog (http://www.fadzjohanabas.com), sharing random thoughts on Twitter (Fadz_Johanabas), and lurking around on Google+ (still getting acquainted with it). Issa kept his eyes trained on the curved ceremonial dagger resting on a bed of rare white silk. Even in the dim slivers of light whispering through the stone grills on the ceiling, the ebony dagger made from star metal gleamed, as if glowing with an inner light of its own. Clear, crystalline veins ran along its length, glittering like the Red Sea at midday. Issa turned to face the High Priest. The tall, austere man’s forehead was creased with stern lines. Standing this close, he looked more imposing in his leopard skin cloak, his shaved and oiled head gleaming. Issa expected to be chastised, but he did not expect to hear the chuckle escaping the High Priest’s lips. For a brief moment, Issa’s chest rose with pride. To his knowledge, the High Priest never praised anyone. Then he looked at his right arm, dangling shriveled and useless like a dry branch. When he looked up, he knew the High Priest noticed where his eyes had lingered. Issa nodded and kept his eyes on the floor between them, humbled by the High Priest’s words. He still had doubts, but he did not wish to shame himself further in front of his revered Master. The High Priest walked past Issa to the back of the great hall. Issa followed quietly, and stopped to face the wall that was filled from ceiling to floor with hieroglyphic murals recording the history of Mother Kemet and the city of Waset from its founding. He watched as the High Priest disappeared into the darkness and reappeared in another pool of light near the eastern end of the wall. Having spent years as a temple scribe, Issa knew the murals decorating the back wall by heart. The High Priest was standing before the section that depicted the arrival of the Aether, encompassing the Heavens over a thousand years ago during the construction of the Great Pyramid of Khufu. Along with the Aether, the Gods had returned and raised their children out of darkness and ignorance. The High Priest pointed at a picture of an ibis, the representation of the great vessel lying dormant just outside the walls of Ipet-Sut. Beside it was an empty space the length of two hands. Issa felt his breath catch. Never in his life had he dreamed of being remembered by people other than his parents. He felt his shoulders weighted down by an oppressive weight. This was not what he wanted. The ship Issa boarded docked just before the branching of the Nile at the Delta, where the wide waters churned yellow with mud. Issa could see barges of varying sizes transporting trade goods and foodstuffs down- and upriver. After his father had sent him to Ipet-Sut at the heart of Waset at the age of six, Issa managed to visit his home in Lower Kemet three, at most five times a year. Even so, not much had changed in the past fifteen years. The smell of dried fish hung heavy in the humid air, burying deep into his nostrils. Flies abounded, flying between people and wares. Issa took off his white linen headdress and swatted the insects that buzzed too close. The sandals he wore did not help much in preventing mud from soaking his feet. Issa sloshed and shouldered his way through the throng of folks congregating around the dock. Men and women alike haggled for wares at the top of their lungs, from wheat and other grains, to clothing and jewelry, and to the finer barley beers of Upper Kemet. The fineries here were crude compared to those made by master craftsmen of Waset; people of the Delta would never be able to afford such jewelry. The market scene was both familiar and alien to Issa at the same time. More than once he had to nudge and force his way through the crowd. More than once he had to avert his gaze from people who openly stared and pointed at his shriveled right arm. Likely they were jeering at him, calling him a living mummy, a name he had earned among the scribes and temple workers. Had he slung his palette over his shoulder as tradition dictated, common folk would show him more respect. But soon enough Issa would be the center of the whole of Kemet’s attention. He needed this anonymity. Nevertheless, some of them noticed the fine quality of his linen tunic, for they lowered their eyes and made way for him to pass by. Just before he left the market, Issa saw a poster made of papyrus paper nailed onto a board. The black ink print showed an illustration of the great vessel back in Waset, and below it was news of the ritual that would take place during the eclipse. Not many people of the Delta knew how to read, but Issa was thankful his name had not been mentioned. He stared at the illustration for a while before continuing his walk home. By the time Issa’s house was within his sight, the sun was well into its descent toward the western horizon. His mud-caked legs ached, and his mouth and throat were parched from the sweltering heat. The square single storey mud-brick hut was just as he remembered. His father’s fishing net was splayed on a rope tied between two stunted mangrove trees, signaling that he was home. The old net was well-maintained, obvious even from afar. Salted fish lay on the ground near the net. Issa could not help but wonder if his parents’ life would go on as usual like this when he was no longer around. Issa pushed the thought away and strode home. He hesitated in front of the crude door made of planks. He heard his parents conversing with each other, but the words were too muffled for him to make out. He settled with just listening to the tone and sound of their voices. His mother pulled opened the door and rushed out to wrap him in a tight embrace. She stood on tiptoes for she was almost a full head shorter than him, but that did not make her grip any less strong. Issa breathed in her comforting scent of earth and salted fish. He in turn studied her. The fine linen tunic he had brought home for her was stained and yellowed with use. He should have stopped by the marketplace in Waset to buy more for her. She wore no finery, and her shoulder-length hair had more white than he remembered. Her olive skin was tanned brown where his was much fairer from spending all those years indoors. Her fingers were rough and calloused, and Issa felt a pang of guilt; his left hand, though permanently stained with layers of ink, was soft as a babe’s skin. “You look no better off yourself,” Issa replied with a smile. Issa followed his mother into the small hut and saw his father sitting by the window, repairing his second net. Age was catching up to him, but he was still the strong, broad-shouldered man Issa remembered. His father stopped mending the net and bored straight into Issa’s eyes. His father grunted and continued mending his net. Issa settled down on his own rickety bed and burned into his memory the familiarity of his home: the scents of fish and stew being cooked, his mother humming an old lullaby in the kitchen, the swishing sound of shuffling net, the soft heat emanating from the ochre walls, warmed by the sun, and the cool floor at his feet. Outside, the riverbank was teeming with life. The calls of ibises and geese lulled Issa into closing his heavy lids. When his mother woke him up, the sun was setting, bathing the land with an orange glow. Dinner was served on the uneven surface of the wooden table, illuminated by the single oil lamp in the hut. Issa stretched and yawned as his mother retreated to put food into clay bowls. The three of them ate in silence until midway, when his father spoke up. “Your brother is dead!” His father’s fist slammed onto the table, toppling his bowl with a loud clang, spilling stew and bread on the floor. Issa heard his mother catch her breath and felt her holding his knee. This was breaking her heart, he knew, but surely they understood his predicament? Issa registered the disgusted look in his father’s face before he stormed out of the hut. They had never been close. Akil was the one who had been close to his father’s heart. Akil was learning to be a fisherman just like his father, as was tradition with firstborn sons, before he was enlisted into the army. Akil looked handsome and majestic driving a chariot. He was deadly with a bow. The Vizier himself had taken personal interest in Akil’s meteoric rise in ranks, and approached him not long ago with an offer of a lifetime. Akil had agreed, committing his family with this great honor. That was before they carried him back home from a skirmish with an arrow shaft protruding from his chest. Issa was never close with his father, but he had never looked at Issa with open disgust and hostility either. He turned to his mother for support, but he could only see the tears welling in her eyes. Issa sat on a stump by the riverbank. He watched the ibises scattered across the marshy shallows, their pristine white feathers making them look like a layer of cloud had settled on the surface of the river. Their stilt-like legs made tiny ripples on the otherwise calm waters, and their discordant warbles broke the stillness of the air. Issa ignored the mosquitoes, only once in a while scratching his neck or legs. At night, the riverbank looked even more beautiful, and the Nile gave off an ethereal bluish-green glow, reflecting the Aether that spread across the Heavens. It was never truly dark, not even in the deepest of night. Issa craned his neck and studied the sky. The moon hung low in the heavens, a pale round eye that watched over the world in silence. Beyond and around it were the majestic clouds of Aether, nebulous masses of blue and green and orange, and every shades in between. The Aether had always been a mystery to the brightest of scholars, appearing one night and bringing gradual enlightenment. Showers of rock and metal that fell from the Aether teemed with beautiful, unfamiliar plant life. Scholars knew there was more to the Aether than they currently knew, possibly more complex life as well, perhaps the dwelling of the Gods themselves, but it was always beyond the reach of humans. Issa tried not to think about what he should be facing instead of cowering here at home. In some of the ancient papyrus scrolls he transcribed, the heavens at night had been said to be black velvet, littered with cold, distant points of light called stars and constellations. Issa tried to imagine a dark, empty sky, but couldn’t. The ever-shifting clouds of Aether were so beautiful, so divine. A small part of him was curious about the Aether and what lay beyond it. But a bigger, dominant part of him was deeply rooted in the harsh lands of Mother Kemet, and among the scrolls in the sacred Hall of Records. Issa’s mother stood beside him with a woolen shawl slung across her shoulders. Issa leaned against her and felt her trace the contours of his face. “I miss Akil.” Issa held an unspoken jealousy toward his elder brother for his charm and strength, but most of all for his wholeness, for his ability to use both arms. He still did, even though his elder brother had passed away. But he loved Akil, and missed him dearly. Issa felt himself stiffen. He had never heard this tale before. “Why didn’t you?” he whispered. Issa choked back his tears. His father had said those words. Issa turned to see silent tears flowing freely from his mother’s eyes, glittering like precious diamonds from the southern lands. She was looking at the heavens, and her shoulders were straight and unmoving, but she did not try to hide her tears. She turned to face him then, and cupped his face in her warm hands. “Whatever it is you decide, know that you will not cause us shame. We are proud of you.” She kissed his forehead and stood up, squeezing his shoulders one last time before walking back into their hut. Issa stayed seated on the stump long after the calls of the ibises had subsided, and the only sounds he heard were the lapping of the river on the shore, and the songs of the crickets. When he entered his home, both his parents were already asleep. He committed their peaceful forms into memory before drifting off to slumber. When Issa woke up late in the morning, his father was nowhere to be seen, along with both his nets. His mother had prepared a simple breakfast of bread and fruits, and she sat looking at him as he ate. Issa knew he had to return to Waset no matter what he would decide. He owed the High Priest of Amun that much. Issa and his mother wept their goodbyes, and when there were no tears left to shed, she packed food for his trip upriver. She gave him another long hug before he left, and he felt his feet heavier with every step away from home. As he reached the last hillock before the dock, Issa saw his father waiting there. Issa hesitated at first, but approached him nonetheless. They stood looking at each other for long moments, his much taller and broader father looking as imposing as the High Priest. He suddenly broke the tense stillness by embracing Issa in a fierce hug. Issa’s breath caught in his throat. His father had never said those words before, not to him, not to Akil. He returned his father’s embrace. Throughout the trip upriver, Issa kept replaying the conversations he had with his parents. It was all that kept him from running away. When he finally reached Ipet-Sut, the whole temple grounds were abuzz with talks of a substitute. He rushed to meet the High Priest of Amun with both dread and hope warring in his head. “Issa, I knew you’d come back.” The High Priest was smiling. Issa wanted to say more, but the High Priest had already turned his back. Issa felt hurt by the curt dismissal, but more than that, for the first time in months he felt a glimmer of hope. Before he left, Issa’s mother had told him that his life was in the Gods’ hands, and that there was nothing finer a mother could ask for her son. When he stepped into the sacred lake just outside the Temple of Amun with the first rays of sunlight, Issa knew the Gods had given him a choice, that he was no longer forced to sacrifice his life because of circumstance. Priests from each of the temples within the grounds of Ipet-Sut attended him in this ritual cleansing. They had shaven off every strand of hair from his body so that he could immerse himself into the still, pristine waters of the sacred lake and emerge anew, reborn with no sins, no wrongs. They lathered him with scented oils until his body gleamed as much as the vessel waiting between the Avenues of Ram and Sphinx. Finally they clothed him with a simple robe of finest white silk and clamped a thick belt of pure gold around his waist. Its weight made his steps heavy, but his spirit was light. He knew he had made the right choice. The procession line was long and grand. Issa sat on a palanquin carried by ten temple guards, behind the statue of Amun carried by four guards. The priests behind him chanted an ancient prayer praising all the major Gods watching over Mother Kemet, their voices beautiful and resounding throughout Ipet-Sut. Issa had seen the vessel since its construction, but it still took his breath away. Shaped like an arrowhead, the vessel had been forged from rocks and metals that fell from the Aether. Hieroglyphic reliefs were carved into its white outer surface. It was said that Thoth Himself had appeared in the young Pharaoh’s dream one night and inspired the god-king to gather sky rocks and metals and craft them into such a vessel that would unlock the mysteries of the Aether. Pharaoh himself had designed and overseen the completion of the vessel. He had named it Ibis, after the sacred bird of the Gods. As he stepped off the palanquin to stand on a platform in front of the vessel, Issa noticed a detail he had never seen before. Near the narrow, pointed bow, a relief of a masculine face with closed eyes and mouth had been carved, beautiful and perfectly symmetrical. The vessel itself was large, the length of six great elephants from bow to stern, and three from wingtip to wingtip. The face was only slightly larger than a man’s, but it stood out in its fine detail. Two young priests helped Issa shrug off his belt and robe, and he stood naked on the platform in front of the whole of Waset. Priests in their finest white linen tunics stood around the platform and vessel in a horseshoe pattern, readying themselves for the ritual. Common folk crammed against one another farther off, and Issa did not know if his parents were among them. He hoped they were safe at home. Then he saw another smaller procession making its way toward a higher-raised platform not far from where he was standing. Pharaoh Ramses himself was at the head of the procession, followed closely by his Great Wife and the Vizier. High Priests of each temple walked behind them at a respectful distance, their leopard skin cloaks billowing in the desert wind. As Pharaoh, his Vizier and his Great Wife stepped onto the pavilion, one of the High Priests broke off from the procession and walked toward Issa’s platform. It was none other than the High Priest of Amun, Issa’s master and mentor. “I told you I have faith in you, did I not?” The High Priest awarded Issa with a warm smile. Issa nodded at the High Priest and turned his head toward the pavilion. “He is beautiful.” He had never seen Pharaoh up close before. The god-king was a child, his bare chest oiled, golden headdress and beard rings glinting sunlight, bathing him in a halo. The boy, the god-king, was all Issa could concentrate on. Both of them looked up, and saw a small dark shadow creeping at the right edge of the great fiery orb. The eclipse had begun. The High Priest took out the ebony ceremonial dagger and laid it flat on his palms. “Ptah, Hathor, Osiris, Maat, Horus, Thoth. Amun-Ra!” The invocation of the Gods were soft at first, spoken by the male priests that surrounded Issa’s platform. Issa felt the skin at the back of his neck prickle with each name. “Ptah, Hathor, Osiris, Maat, Horus, Thoth. Amun-Ra!” This time, melodic female voices joined in, and the chant became a song, rising in volume and intensity. The chant continued as the shadow crept further to engulf the sun. Before long, Issa could only concentrate on the resounding “Amun-Ra!” His heart was beating faster; he still felt fear deep inside. He looked up at the progressing eclipse. As the shadow completed a full circle, the last rays of the sun flared brilliantly, as if unwilling to give up its dominance. Then, true darkness. In those brief moments, Issa finally saw the black velvet sky he had read in the ancient scrolls. A fat tear rolled down his cheek. After that brief darkness, the Aether gradually reappeared, visible as it always was during the night. Issa knelt down before the High Priest and tried his best to calm his shaking body. He knew the only part not shaking was his dead right arm. Issa chose to face his fears and searched for the calm within his soul. “Osiris, take my soul and guide me. Amun, take me home.” His voice was barely a whisper, but he saw the High Priest smiling his approval. Just as the High Priest repositioned the dagger and held its hilt in his right hand, a flock of ibises flew overhead, warbling their discordant song above the voices of the chanting priests. After they had passed, a single white feather floated earthward, and landed at the tip of Issa’s head. Issa heard another resounding “Amun-Ra!” His heart beat so hard his chest felt like bursting. He closed his eyes and faced heavenward. The blade plunged deep into his chest, and his heart stopped beating altogether. The whole congregation, including Pharaoh, held their breath as Issa’s form slumped onto the platform. With another brilliant flare, the sun returned in all its glory. The only sound heard throughout the hallowed grounds of Ipet-Sut was that of the billowing winds that carried sand and desert heat. For long moments, nothing happened. Then, a silver glow came to life on the hieroglyphic depressions on the vessel, Ibis. The High Priest, who was the closest to the vessel, kept his eyes on the carved face on the vessel. The eyes became slits of golden light at first, but gradually both lids opened fully and blinked like a human’s would. The mouth opened and closed, as if testing the function of the lips. The High Priest knew the face was talking to him. He bowed low. With that, Ibis gazed heavenward. A deep rumble growled at its stern, and intense white flames spewed forth. Heat emanated from the vessel as it angled upward until the arrowhead pointed straight at the heavens. With a mighty blast, Ibis shot upward, flying toward the Aether. Ibis surged ever forward, drawn toward a purpose delayed, but not forgotten. First published in Aether Age: Helios, available in hardcover and paperback by Hadley Rille Books (ed. Chris Fletcher (M-Brane SF) and Brandon Bell (Fantastique Unfettered)).